30 Second Wine Advisor: Austrian Tradition! Stock up on award-winning, handcrafted wines already discounted to as low as $8.99 during The California Wine Club's Cellar Clearance Sale. Special Offer: Order by 11:59 p.m. (PDT) on May 31, 2014 and save an EXTRA 10% when you use coupon code 10CELLAR14. Plus, you'll enjoy $1 shipping on every case and half case! Tradition! Shout out the word, and you might start hearing Tevye the dairyman singing the popular tune from "Fiddler on the Roof" in your head. Then open a tall, cool green bottle of Gobelsburger Kamptal Grüner Veltliner from Austria, and you might just start singing "Tradition" yourself. Even with a desirable if not-so-traditional metal screwcap to ensure clean freshness, it's hard not to hear the voice of tradition in a wine from Schloss Gobelsburg, a wine-producing property associated with the monks of Zwetti in Austria's Kamp river valley (Kamptal) for close to 1,000 years. The Zwettl Monastery was founded in 1074, according to distributor Michael Skurnik, and in 1171 the Monks of Zwettl were granted their first vineyards. Now, that's tradition. The monastery has contracted with Eva and Michael Moosbrugger for vine growing and wine making since1996, and Michael Moosbrugger was named Austria's "winemaker of the year" by the national wine magazine Falstaff in 2006. Gobelsburg has come a long way, but it continues to deeply honor Austria's ancient wine-making tradition. Says Skurnik, "The winery continues to utilize organic winegrowing and has benefited from the fact that the monks of Zwettl Monastery began these practices as early as 1958. "While many international cellars are attempting to produce clean, uniform wines, Moosbrugger is convinced that the future Gobelsburg lies in individuality and character. As a high level of technology is necessary to warrant uniformity, Moosbrugger believes that individuality can only be achieved through the reduction of machines." For example, Moosbrugger developed what he calls a 'Dynamic Cellar Concept,' an approach that avoids pumping wine in production through hoses but gently transports them in wheeled barrels around the cellar. Their care ... their tradition ... shows in the quality of the wine. My tasting notes are below. This will incorporate both red and white winess (and rosado!) from all regions of Spain, and those who for any reason have a hard time finding Spanish wines may go for the nearest geographic or stylistic neighbors. Pyrenees or Roussillon in France, for instance, or non-Port Douro reds and Portuguese whites bordering on Galicia. Special Offer: Order by 11:59 p.m. (PDT) on May 31, 2014 and save an EXTRA 10% when you use coupon code 10CELLAR14. Plus, you'll enjoy $1 shipping on every case and half case! FOOD MATCH: Grüner Veltliner makes a natural match with freshwater fish, goat cheeses or soft white cheeses like Camembert and Brie. I'll never forget traveling in Austria during spargel (white asparagus) season, so in homage to those memories I matched it with a fresh asparagus frittata loaded with onions and garlic. WHEN TO DRINK: Grüner Veltliner can benefit from aging, and Wine-Searcher.com actually shows some European vendors offering vintages back to 1998. The wine's sturdy metal screw cap should also keep it clean and fresh. That said, it might make sense to buy the youngest available and cellar it yourself if that's your wish. VALUE: My local price is a few bucks above the $15 U.S. average shown on Wine-Searcher.com, but I'm satisfied with its quality-price ratio in the upper teens. WEB LINK: Schloss Gobelsburg offers its attractive website in German and English. Here's a link to its fact sheet on the Goldsburger Grüner Veltliner in English. It also publishes a Facebook Page in English. Importer Michael Skurnik also provides a detailed article about Schloss Gobelsburg, with links to reports on many of its wines. 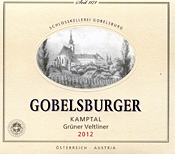 Locate vendors and compare prices for Gobelsburger Kamptal Grüner Veltliner on Wine-Searcher.com.